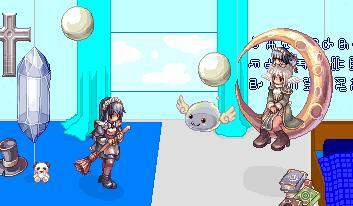 Made with the Alchemist Sprite and the Image of a dress this. I wanted to do something that has warm colours in it. But...too much of this coulors =_="
The Nekromantio or Nekromanteon, the Oracel of Death. 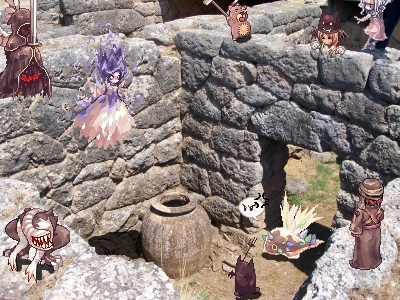 Because I also was near of slipping away on this rocks, I had this Idea. Nothing big but a memory. The Writing on it is from ASP's "Panik". Andraste, a Necromancer in a (undone) Story of mine. "You're out of danger, because I'm no longer by your side. You know one day my dark side want to kill you and then I'm far away from my beloved, my Angel - You. And now you cry, but there aren't tears with good Feelings...So why do you cry? You're safe, become lucky...."
Hmm... that quote from your friends story is interesting. 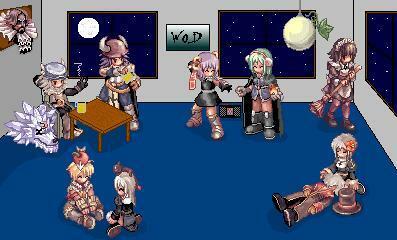 I like fan made stories based on Ragnarok Online. It only should say: "No matter what is against us, I will fight to be by your side...<3"
"Meister, Meister, gib mir Rosen, Rosen auf mein weißes Kleid. Stech die Blumen in den blossen, unberührten Mädchenleib." Sprite Edit from the Song "Kleid aus Rosen" by Subway to Sally. My guild. I like them all and then I started this and that's the result. Pixel -.- I uploed a better edition, I promise. As old as Hels...but...Okay, I really don't know why I didn't uploaded it. xD Maybe it's because the -only her-Part isn't ready yet. The room maybe is too empty or to full, I don't know for me it's enough, not to much, not to less. In RPGs Assassins and Mages are normally my favourite characteres. 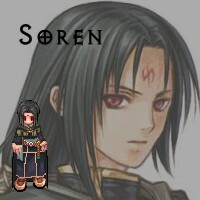 This is Soren, a young mage out of FE: PoR, for me the best mage in this game. I made him (yes, he is a guy xD) because a friend of mine like him a lot (me, too. I want him as a brother >_<). It was a hard thing to do this, because most of this sprite, I must shade myself (except Head :x) and I'm not that good in it. The shoes aren't right but I tried the sandals and I failed. All in all I like it. I don't know why I made her, but I like the result. I know that some mistakes (like the table) could have been erased but...I had other things to do. 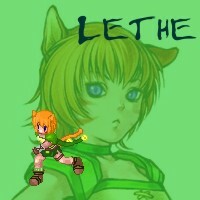 The only one which I did with Corel Photo Paint X3. NPC-Head cut off (I killed a NPC |D xD), put the head on, headgear, background, some other stuff -> You can see the result. 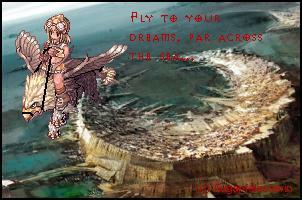 It's my Sniper flying on a Gryphon over a Concept Art from Guild Wars o.O"
The Text (which is not readable because Paint ruins everything...) is a text passage out of the Song "Dark Chest of Wonders" by Nightwish. -> "Fly to your Dreams, far across the Sea..."
Nebenbei -> das ist Gandara, die Mondfestung in Kourna, ein Großteil der Stadt gehört allerdings zur Gefängnisinsel. Beim Angriff der Sonnenspeere wird der Hafen fast komplett zerstört, jedoch schaffen es die Kounier die Stadt gegen die Sonnenspeere zu halten wegen Abaddon. This idea came to me when I saw a present of a friend (I don't know the english word, but by us it's called "Räucherstäbchen" xD). It was a bit to late when I made it, but it's my valetine present to my dearest boyfriend. mäh das bild is so toll .__.